All our paintings are 100% hand painted by our artists from sketch to finish, step by step. You can see the raised paint and brush strokes and how it dried. We only use quality paint since it is environmentally-friendly and never fades. This canvas wall art are very popular in decoration market. "Framed" means painting will Stretched on strong wooden frame, ready to hang on wall. "Unframed"means painting will come Unstretched, canvas only, packing with shrink film and rolled into tube. We only use museum quality paint since it is environmentally-friendly and never fade. Each canvas art is custom made. Actual artwork may be slightly different from the product image. Framed and Stretched, Ready to Hang. Edges are painted. Each panel has a black hook already fixed on the wooden bar for easy hanging. 100% Hand-painted oil painting on canvas by professional artist. The landscape pictures show online are taken from actual artwork which are made from our studio. Textured and raised paint are clearly. 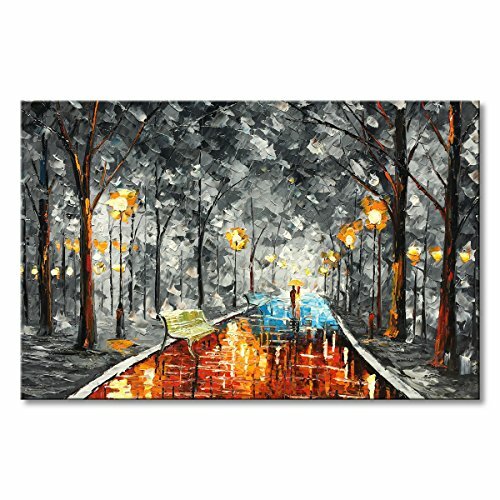 This Orange Night Rainy canvas wall art suitable for wall decor, home decoration for living room, bedroom, office, dinning room, kitchen, hotel, bathroom, bar etc. Custom size and design are welcome. A perfect gifts for your friends and relatives. If you have any questions about this product by Everlands Art, contact us by completing and submitting the form below. If you are looking for a specif part number, please include it with your message. Startonight Canvas Wall Art Amazing Maple, Trees USA Design for Home Decor, Dual View Surprise Wall Art Set of 4 Total 35.43 X 47.2 Inch 100% Original Art Painting!